J.G. 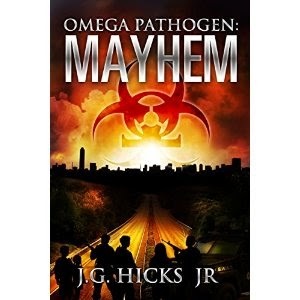 Hicks Jr's "Mayhem," book 2 in the Omega Pathogen series, delves into the origins of a horrible plague while also showing the aftermath of its spread on society. The virus, called the Siberian Cannibalistic Aggressive Rabies virus, turns ordinary people into killers. The protagonist is Jim Matthews, a sharp, resourceful man whose priority is surviving with his family. Fortunately, Jim has plenty of survival skills, as a paramedic and former cop. The plot of the story is well paced with lots of action and suspense. I love that the story switches from modern day with Jim to decades ago in the Soviet Union, to build the back story of the virus. The author does a great job describing the virus and making the reader see how it developed into the threat that is putting Jim in danger. This book is highly recommended to anyone who enjoys post-apocalyptic fiction.